The people charged with helping to turn Lynn’s economic development visions into reality piled into a shuttle van Monday morning and toured the weed-choked and cracked concrete sites where city leaders hope to make dreams come true. When the tour stopped at the broken-down wood piling breakwater behind Walmart, federal Housing and Urban Development, acting regional administrator Kristine Foye surveyed distant Nahant and said Lynn officials have come a long way from talking about developing Lynn’s waterfront to mapping out plans. 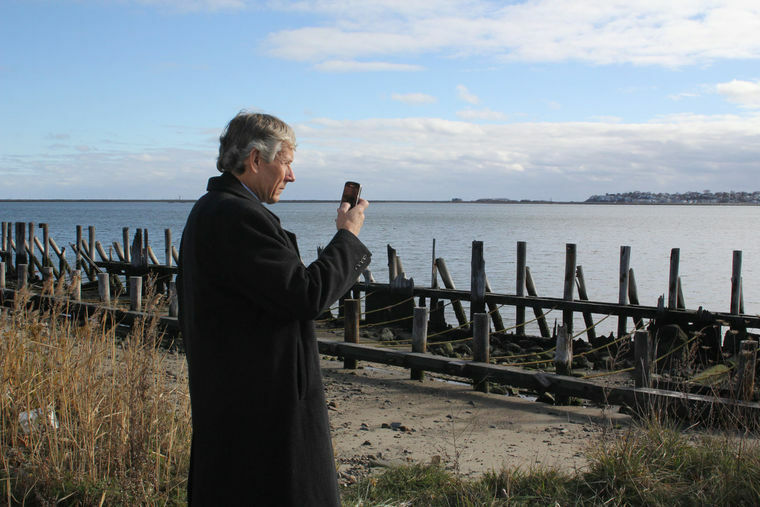 Bob Shuymako, the regional director of planning for HUD, takes note of the sea wall at Hanson Street and Riley Way Monday during his tour of sections of Lynn with the LEAD Team. “They still have a long way to go but they have a good eye to the future,” Foye said. Waterfront landowner Joseph O’Donnell last Monday said he wants to build housing on the 17 acres he owns near the General Edwards Bridge. and Foye said federal housing development money and loans are “economic development tools” to make housing developments reality. Elected officials who stood on City Hall’s steps last Monday pledged to make sure city, state and federal officials work to carry out Lynn’s development plans. Those plans envision development on O’Donnell’s land as well as other locations visited by Foye and fellow officials on Monday, including former General Electric land owned by Swampscott resident Charles Patsios; the Beacon Chevrolet site near Seaport Marina, and vacant land next to the Willow Street post office where Whyte’s Laundry once stood. Federal Economic Development Administration specialist Matthew Suchodolski described himself Monday as “here to listen.” But Jason Denoncourt, economic development director for U.S. Rep. Seth Moulton, said Suchodolski plays a key role in bringing federal resources to bear on development projects. Suchodolski, Foye and other federal officials got a closeup look at the Whyte’s site, an overgrown hole in downtown that could be the key to unlocking downtown development once necessary environmental cleanup measures are taken. “Whyte’s is a huge bellwether for future downtown development,” said Moulton district director Rick Jakious. Some waterfront locations like the ferry dock on Blossom Street extension are pieces already fitted into the city’s economic development puzzle. City Economic Development and Industrial Corporation project coordinator Bill Botnick said the dock is located within site of local employers Traditional Breads and Kettle Cuisine and the Beacon Chevrolet site. Botnick said the potential for a “walkable waterfront” opens opportunities to link the ferry and development locations along Lynn’s coastline. Jakious said a first-hand look at Lynn’s development potential will make it easier for the city, aided by state agencies, to work with Foye, Suchodolski and other federal representatives to help developers launch projects. “We’re looking forward to working with them,” added Foye.